Hi there! Today is the second day of the Lawn Fawn September Inspiration week! The new products are all available at Lawn Fawn now! We have lots of new fun and inspiring projects to share with you over the next week to show you some creative ways to use these amazing new stamps, dies, inks and papers! Today I am using the super cute Simply Celebrate Winter stamp set, coordinating dies and Winter Scripty Sentiments. I used some of the new White woodgrain card stock for the bottom of my card and paired it with a piece of patterned paper from the Really Rainbow 12 x 12 paper pack. 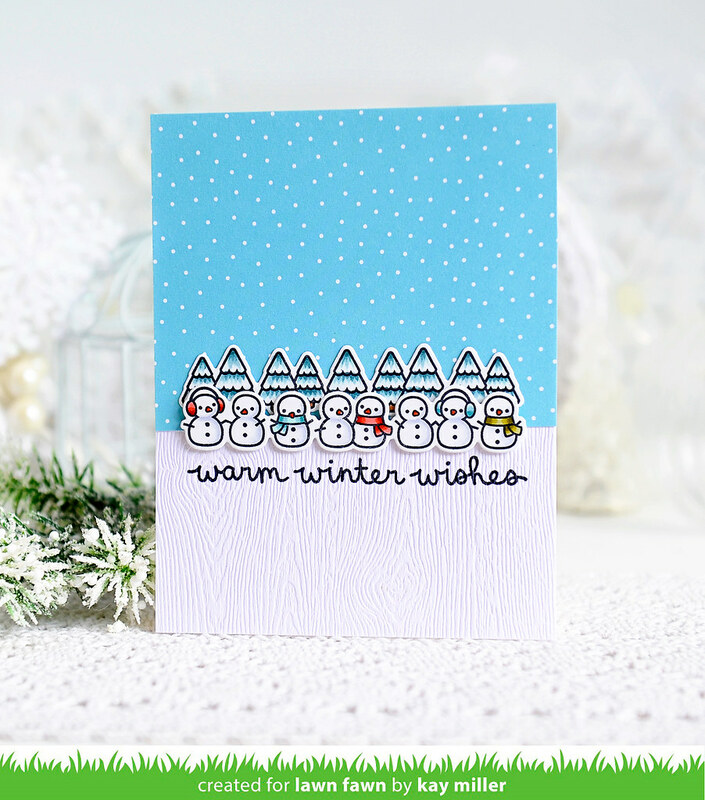 The cute little snowmen and trees were all colored with Copic markers, cut out with the coordinating dies and added to the card with foam tape. I was unsure of how the sentiment would stamp on the highly textured woodgrain card stock, but it worked beautifully! 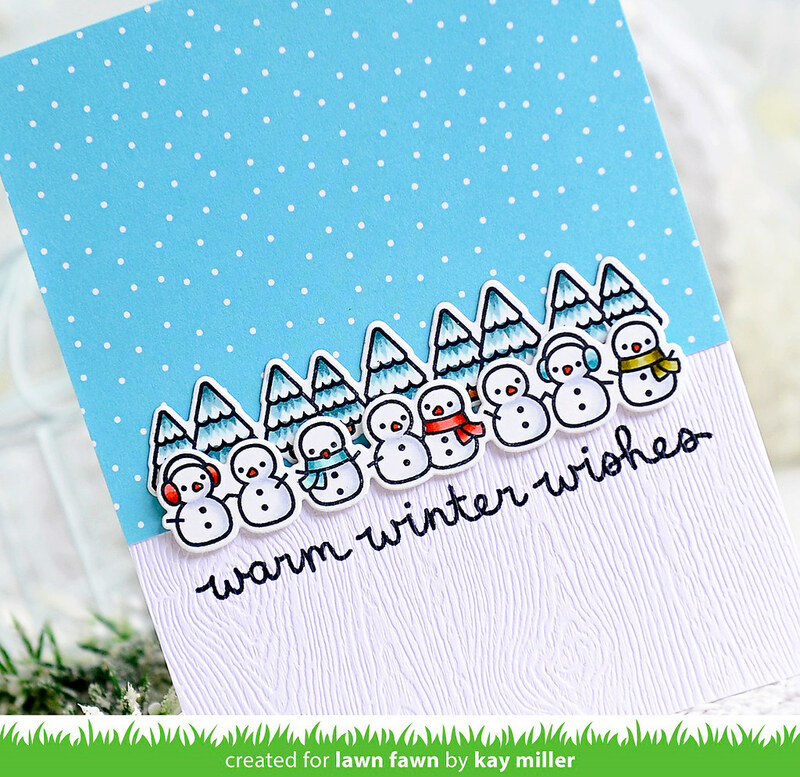 That is just stamped one time with the super cute new Winter Scripty Sentiments! Be sure and check out the Lawn Fawn Blog for more inspiration from the Design team and all the details about when you can get your hands on these fun new products! This is fabulous, Kay! How fun to add the snowmen in front of the trees. The coloring is wonderful and the images look great against the woodgrain paper. SO neat that the sentiment stamped so beautifully one time! Excellent work, my friend. :) Hugs! This is so adorable Kay. I need to check out that white wood grain cardstock. Thanks for sharing.